It’s real rare I’ll ever talk about beauty tips, health tips, exercise tips, fashion tips… etc etc etc. I mean there’s a real good reason why – most weekends, scratch that, every weekend you’ll find me in yoga pants and painted on tank tops. My hair is usually in a messy ponytail trying to hide the left over paint in it…from the previous weekend. The latest color my nails are painted….are whatever color I last spray painted something. And my work outs? Dragging pallets around. However, my work space for my full time job is shared with a great friend of mine – who is a real health nut. She is crazy over all those off the wall health tips Pinterest is full of. She does them all… and she looks great. So, slowly it’s rubbing off on me. I originally started hearing about all the amazing uses for coconut oil last year at the Haven Conference from my roommate, Anne Marie, of White House Black Shutters. She’s a SERIOUS guru about coconut oil and all the possible uses for it. Well, initially I was more freaked out that you could use one thing and put it on your face, in your hair, on your baby, cook with it, bake with it, etc etc etc. Things like that just weird me out rather than most, who think it’s so amazing! Well a year later, I’m finally caving. If you follow me on Facebook I asked how most people use it and started thinking maybe I could use it… just for ONE use to start. The girl I share my work space with uses it mostly for her face, so I thought I’d start there. I finally picked up a jar of Coconut oil and have been using it as a face wash every night and morning. And in addition at night after I wash my face at night with it, I put a little on as moisturizer again. I’ve been doing it for about a week… and I’m totally loving it! Instant results – softer smoother skin, seriously. I’m going to do a comparison 30 days from now and really see if I visually see any results. But even if I really don’t… I don’t think I’ll be going back to regular face wash! Have you heard about drinking honey and cinnamon and losing inches? Too good to be true? Maybe…. but my friend says she does it, and whether she actually loses weight or not, she said it fights water weight and you do feel healthier from it. 2. put the cinnamon in a cup or bowl. 3. boil one cup of water. 4. pour water over the cinnamon and let it steep for 30 minutes. 5. once the liquid has cooled, add honey. Always add honey to the cooled liquid – hot liquid will destroy the enzymes in the raw honey. 6. drink half of the resulting “tea” before going to bed. Cover and refrigerate the rest. 7. drink the other half first thing in the morning. But I also read this post by AlmostExactlyBlog.wordpress.com and she actually did some research regarding findings of weight loss & honey/cinnamon. Wasn’t anything earth shattering. Well I made it this morning intrigued because figured it would just taste like a “spicy” tea… I didn’t know the serving sizes at that point. I just dumped some cinnamon in a glass, added hot water, mixed in honey….. got ready to drink and GAGGGGGG. Ugh, it was horrible. It’s like a thick paste. I’m going to try again, and maybe again, in the correct amounts and see if it’s doable for me. I’ll keep you all posted what I think of it and if I think it’s worth it in a month from now. What latest trends have you jumped on? What do you think of all the beauty tips floating around now because of Pinterest? This post was brought to you in partnership with The Home Depot and ScotchBlue™ Painter's Tape. What DIY projects are top on your list this summer? Ours have been revamping our outdoors! I made a long to do list which I shared with you earlier and we have slowly but surely been making our way through it, plus just tackled out front patio this past weekend. I really wanted to bring the front space to life and add in a variety of colors which we’ve never really done before. Anything DIY outdoors really frightens me, it’s just an area I’m not as brave in. However we finally started working away and I’ve been really pleased with what we’ve been able to do! I knew one of the easiest ways to bring in color would be to make over our bench that we’ve had sitting out front for the past two years. I scored this bench at a garage sale for like $10 two years ago, the first year I sanded it down and painted it a neutral grey color. I wanted to make it over again this time with some fun brighter colors. Don’t you love how it turned out??? I love the dipped effect that I decided to do with it too. I feel like it really stands out and is more of a feature in the space. Here’s my run down of how I painted this bench. First I cleaned the bench off and let it fully dry. Then I did a first coat of primer since it’ll be used outside and will help the paint really adhere to the surface. When in doubt – I always prime. Then I used quart paint cans to prop up the bench so I was able to paint the entire legs easily. I spray painted the bottom of the bench with the color I wanted to be “dipped”. I did two coats to ensure full coverage, including the lower support bars. Typically a dipped effect isn’t as high up but because I wanted the effect to be able to be seen from the street, I went a little higher up. Then I wrapped the lower part of the legs in tin foil to protect it while spraying the remainder of the bench. I could have covered the entire lower leg parts with the ScotchBlue™ Painter's Tape , but using tin foil let me save a lot of the tape! The important part was to be sure to have clean cut lines for the edge of the two colors so I only wrapped the lower part in tin foil. Then the support bars, and the upper part with ScotchBlue™ Painter's Tape. The big benefit of using ScotchBlue™ Painter's Tape is I’m able to wrap it around the curved surfaces really easily, and while it’s protecting the already painted portion, I also know I’ll get clean paint lines with the two colors. Next I just sprayed the remainder of the bench with my second color and let it try thirty minutes in between coats. I paired it with this perfect cushion I found that pulled a lot of colors we were using in the front garden, and the accent color maroon from our front door. Here’s a big ol’ sneak peek at our newly finished front patio space!!!! I have so much to share about all the changes and our DIY’s so stay tuned! I’m so excited to be a part of this amazing with so many other inspirational painting projects! Now here’s the extra exciting part for you!! GIVEAWAY TIME! 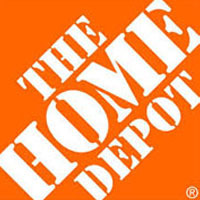 The Home Depot wants to give one of my readers a $75 gift card to tackle their own DIY project that’s been inspired (hopefully) by me! Entry is EASY! The first entry is easy to do – just leave a link to your favorite summer DIY or painting project in the comment section below for a chance to win the $75 Home Depot gift card and confirm by the Rafflecopter below! Awesome giveaways like this make me sad I can’t enter my own giveaways hah! So be sure to follow them! This post was brought to you by ScotchBlue Painters Tape & Home Depot. As always I only share products and companies I love and use myself. When is the last time you had a professional photographer take your family pictures? If it’s been longer than a year, I strongly suggest you start planning on getting a session done soon! I am quite lucky that my best friend since 6th grade is one of the most amazing photographers I know and she takes our family pictures whenever we get back to Minnesota for visits. Her business is Ashley J Tyler Photography and she is an amazing lifestyle photographer. She has done a handful of sessions for us over the years since Jackson was born, but over the past couple years we don’t get back to MN as frequently so our sessions have been cut down. We did one session last August with her and this was one of my favorite shots from that session. It was the last family shot we really have of just the three of us (actually little Makenzie is tucked away in my belly but you can’t really tell I’m pregnant even). Well we were able to get back up to Minnesota over Memorial weekend and did our first family of 4 photo shoot and I am just in love with all the pictures we got!! If you follow me on Facebook you’ve already seen a few handful of them but I wanted to share a few more with ya. Ashley asked me what kind of background setting I wanted for this session and we tend to go back and forth of our sessions between “nature” or “industrial”. I knew our clothing was a little brighter in color and wanted a background that would enhance that too and she immediately knew this yellow wall would be perfect and I LOVE the punch of color it adds! When I saw the pile of pallets I just had to have some pictures in front of them! Too perfect for us! I treasure these pictures, plus all the other sessions and pictures Ashley has been able to capture for us. I’m also SO happy that modern photography has come light years from what “family pictures” used to be! I may be bias but I sure do think we’re one cute family! This discussion is brought to you by P&G and The Home Depot. As you may know I really wanted to tackle our outdoors this spring. I have a long to do list of project’s, upgrading, and cleaning. But honestly, cleaning is my most HATED “chore” of the outdoors. Cleaning indoors can be a lot of work, but what grows and builds up outside is just NASTY. It’s a whole different world out there….mildew, grime, grass stains, mold, nastiness, etc etc etc. Can you tell… I just love it out there. Hah! Well, knowing I had all this to do, and given the opportunity to try out some outdoor cleaning products from P&G and The Home Depot for their #ReadyDoneClean campaign, I knew it was the perfect motivation to get this “to do” finished. Here’s where I get really weird about these products with you guys. Yah. Do you see that sparkle? No photo editing. No sore arms. No sweat. Literally all I did was spray the toys with the Mr. Clean Outdoor Pro spray and then sprayed with water. No scrubbing. I’m NOT kidding. I have this sever phobia of mold. I think of them as little black dots of death. And the wood of his wagon was covered in it. BLEH. Now we all love Magic Erasers. They’re incredible for so many reasons around the house. Well, now add outside the home too. Can you kind of see why I’m freaking out over these products?? They do an AMAZING job and all I did was spray on, and spray off with water. Originally that’s where I was going to stop, but this was working so well I was intrigued to test it’s power. Are you ready for me to seriously embarrass myself? Parts of our outdoors have been neglected…like seriously neglected. I’ve been wanting to schedule a power wash for our house but every weekend slips by me. So there’s one part of our house that is insanely dirty from grass/rain/ickiness. Okay so to test the Mr. Clean Outdoor Pro all I did was spray the product on our siding, let it sit for a minute or so… and sprayed it with the jet setting from our hose. It’s not “perfect” but for not even scrubbing it’s an incredible solution that is so easy!Way to go Mr. Clean! Proctor & Gamble and The Home Depot provided me with these products for review, and provided me with the bundle of goodness to giveaway to a lucky reader! As always, I only share products and companies I absolutely love myself! Come see the little side project I'm working on! Copyright © Pamela Stephens and PB&Jstories, 2012. Unauthorized use and/or duplication of this material not limited to images, words, or descriptions, without express and written permission from this blog’s author and/or owner is strictly prohibited. 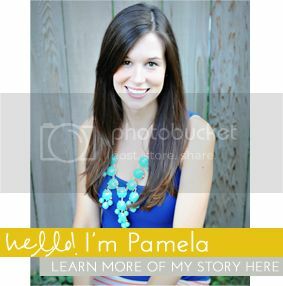 Limited excerpts and links may be used, provided that full and clear credit is given to Pamela Stephens and PB&Jstories with appropriate and specific direction to the original content. Header, menu bar and custom template by Simply Klassic Design Sidebar tabs and buttons by Blessed Design Studio Copyright © 2012 PB&Jstories. All Rights Reserved.